I love pressed, baked tofu. Baked tofu, unlike its uncooked, white counterpart, is firm and chewy. 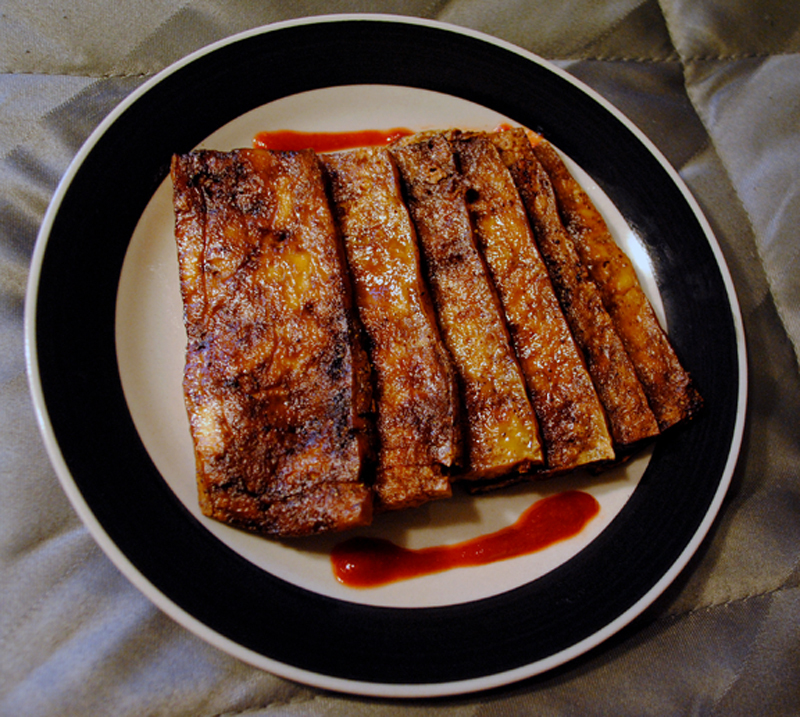 Standard baked tofu has a meat-like texture that turns the typical spongy, slippery, squishy tofu into an ingredient capable of appealing to the masses, including all those tofu-phobia folks. The only problem with baked tofu is that the prepackaged kind tends to be rather overpriced, transforming a once fairly-priced vegan protein into somewhat of a gourmet ingredient. With that being said, I’ve wanted to experiment with baking my own tofu for quite some time now. For my first attempt, I’ve combined one of my favorite Indian spice mixes with a bit of Asian-salty flair to create a warm baked tofu that beats many of those store-bought varietes. Make extra, store in the fridge, and use as a snack, sandwich material, or enhancement for any of your future meals. Slice tofu lengthwise into approximately 8 1/4-inch pieces. Between two dishtowels, press tofu for 30 minutes, placing a heavy object on top (such as a heavy cutting board, stack of books, etc.) to remove excess water. In a small bowl, whisk oil, soy sauce, and garam masala. Preheat oven to 375F. Line baking dish with aluminum foil and lightly oil the dish. Place tofu in dish and use a spoon to distribute the sauce over top the tofu. Sprinkle with freshly ground black pepper. Bake for 20 minutes, then flip and bake an additional 20-25 minutes, or until firm and edges are crisp. I haven’t tried tofu this way yet – it looks great! I love baked tofu; and I love having some in the fridge for meals and to snack on… Your recipe looks and sounds delicious! We first tried baking tofu fairly recently. We marinated it in teriyaki sauce first, and I loved it! Your recipe sounds good! I like the texture and taste better baked! So that’s how Whole Foods makes it so firm. Good to know. Sounds easy. Yum! I don’t think I have ever bought the prepackaged baked kind, but I have bought gardein and other products like that so if you are referring to those, then yes I have tried them. But otherwise I always marinate and bake my own. Hello! I just randomly stumbled upon your post/recipe, and put it to good work immediately. The tofu turned out wonderfully, and my boyfriend (who’s actually had baked pressed tofu before) said it was better than what he’s had from the store. Thanks for sharing, and for converting us to homemade!